Z Pan, D Sarma. 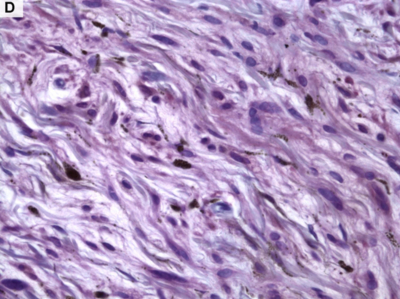 Pigmented Neurofibroma Of The Skin: A Case Report And Review Of The Literature. The Internet Journal of Dermatology. 2006 Volume 5 Number 1. Pigmented neurofibroma (PNF) of the skin is a rare variant of neurofibroma that is frequently seen among the patients with neurofibromatosis type 1, and it accounts for less than 1% of all neurofibromas. We are reporting such a case with a review of the pertinent literature to highlight the differential diagnosis. Pigmented neurofibroma (PNF) of skin is a rare variant of neurofibroma. It has often been confused with other pigmented cutaneous tumors, especially pigmented dermatofibrosarcoma protuberans. The purpose of this paper is to report a case of PNF, and to review its differential diagnosis. A 69-year-old female presented a 0.5 cm flat, pigmented skin lesion on the right dorsal forearm present for many years. She did not have any other skin lesions or any evidence of neurofibromatosis .The past medical history and the family history were unremarkable. 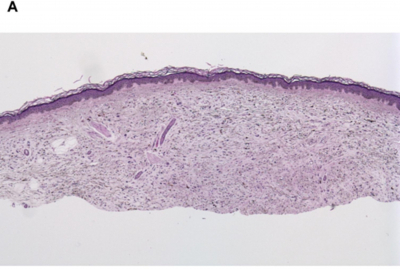 Microscopic examination of the biopsied skin lesion showed a normal epidermis with a pigmented spindle cell proliferation in the dermis (Figure 1A). The tumor cells were spindled and elongated with wavy pink-blue cytoplasm within myxocollagenous matrix (Figure 1B). The nuclei were oval, spindle or comma shaped with the finely dispersed chromatin. The nucleoli were inconspicuous. No mitotic figures are identified. Scattered cells with coarse granular dark-brown pigments in the cytoplasm were present in the tumor (Figure 1B inset). Immunostaining showed that the tumor cells were diffusely positive for Vimentin, S-100 protein, and Melanin-A (Figures 1C and 1D). Figure 1A: H&E, 2X. Low magnification showing the dermal spindle cell tumor. Figure 1B: H&E, 20X. Tumor cells are loosely arranged in an abundant myxocollagenous matrix. 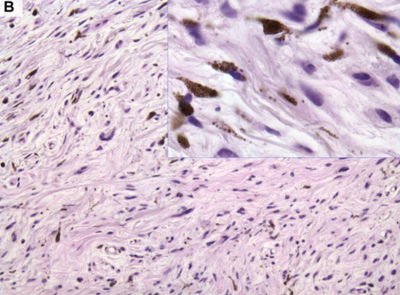 The inset shows spindle tumor cells with coarse granular dark-brown pigments in the cytoplasm. Figure 1C: Immunostain, Melanin A, 40X. Positive spindle cells. Figure 1D: Immunostain, S-100 protein, 40X. Positive spindle cells. Pigmented neurofibroma (PNF) [1, 3, 4, 5], also named melanotic neurofibroma, is a rare variant of neurofibroma. PNF is derived from neural tissue, and it has a typical histological appearance of a neurofibroma with scattered melanin-laden cells. 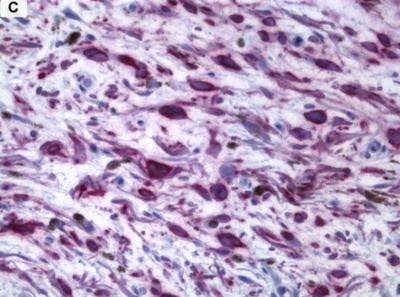 Immunohistochemical studies demonstrate that the non-pigmented spindle cells are positive for S-100 protein, Melan-A, and CD34, but negative for HMA-45. But the melanin-producing cells are S-100 (+), MITF (+), Melan-A (+) and HMB45 (+/-), but CD34 (-) . 1. Williamson DM, Suggit RI. Pigmented neurofibroma. Br J Dermatol. 1977 Dec; 97(6):685-8. 2. Dupree WB, Langloss JM, Weiss SW. Pigmented dermatofibrosarcoma protuberans (Bednar tumor). A pathologic, ultrastructural, and immunohistochemical study. Am J Surg Pathol. 1985 Sep; 9(9):630-9. 3. Fetsch JF, Michal M, Miettinen M. Pigmented (melanotic) neurofibroma: a clinicopathologic and immunohistochemical analysis of 19 lesions from 17 patients. Am J Surg Pathol. 2000 Mar; 24(3):331-43. 4. Inaba M, Yamamoto T, Minami R, Ohbayashi C, Hanioka K. Pigmented neurofibroma: report of two cases and literature review. Pathol Int. 2001 Jul; 51(7):565-9. 5. Motoi T, Ishida T, Kawato A, Motoi N, Fukayama M. Pigmented neurofibroma: review of Japanese patients with an analysis of melanogenesis demonstrating coexpression of c-met protooncogene and microphthalmia-associated transcription factor. Hum Pathol. 2005 Aug; 36(8):871-7.